Enviro-Vac Shrink-Wrap is a state-of-the-art specially formulated, high strength polyethylene film that shrinks when heat is applied. The heated plastic film shrinks to create a perfect fit around any object, framework, or engineered scaffolding, is fire retardant, and has UV inhibitors. Enviro-Vac is an industry leader in developing and installing engineered, industrial shrink-wrap containment systems for negative pressure, high-risk containments and have provided solutions to Canadian organizations of all sizes for an endless number of diverse applications. Enviro-Vac consistently sets the highest standards for reliability and "on budget - on time" performance in a variety of industrial and specialized markets including Weather Wrap for winterization of scaffolds or structures to keep the cold wind and snow out. 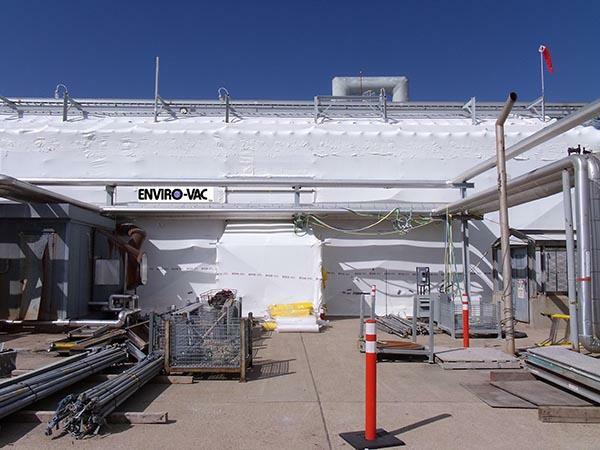 As an expert in shrink wrap containment enclosures and cold weather wraps, Enviro-Vac works with clients throughout Canada and has offices in Vancouver BC, Victoria, BC, Edmonton and Calgary Alberta. Our industrial shrink-wrap keeps airborne contaminants IN and the rain, snow and sun OUT. This reduces downtime due to weather and other external factors. Enviro-Vac's unique ability to install and maintain negative pressure inside our engineered shrink-wrap containment systems is unmatched and is a cost-effective and environmentally sound method of containing hazardous materials and creating airtight enclosures. Enviro-Vac's industrial shrink-wrap has been specially formulated to set new standards in the hazardous materials abatement industry. It has been formulated to withstand strong winds and provide enhanced UV resistance and durability in a negative pressure environment. The shrink-wrap is fire rated and made from high density polyethylene making it ideal for stronger joint welds, minimizing risk of a hazardous materials abatement containment failure. Shrink-wrap is ideal for creating effective environmental containments and is particularly effective at adapting to awkward shapes as it can be cut and heat-welded in place. Heat-welding of shrink-wrap joints creates a smooth, continuously bonded enclosure able to resist strong winds and negative pressure environments. Enviro-Vac's shrink wrap is fire rated. The Enviro-Vac Shrink Wrap system is great for winterizing your location - protecting workers and equipment from the elements.